In 1611, thirty-four-year-old Nur Jahan became the twentieth and favorite wife of the Emperor Jahangir, who ruled the vast Mughal Empire. An astute politician as well as a talented dress designer and innovative architect whose work inspired her stepson’s Taj Mahal, Nur was the only woman to acquire the stature of Empress in her male-dominated world. 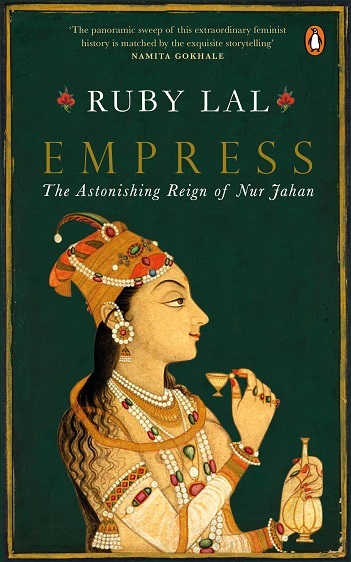 In Ruby Lal's Empress: The Astonishing Reign of Nur Jahan, she finally receives her due in a deeply researched and evocative biography that awakens us to a fascinating history. Following is an extract from the chapter 'Miracle Girl'. When a large comet passed startlingly close to Earth in the autumn and winter of 1577, astronomers, astrologers, philosophers, and monarchs all over Europe and Asia, including the Mughal emperor Akbar, were spellbound. The distinguished Danish astronomer Tycho Brahe made precise measurements of its path, findings later used by his student Johannes Kepler to formulate the laws of planetary motion. Known for his curiosity and open mind, thirty- five-year- old Emperor Akbar was in the twenty- first year of his reign when a comet, Zu-Zanab— literally, “possessed of a tail”—became visible in the skies over India, bright enough to be seen in daylight. The celestial body that Europeans called the Great Comet provoked intense discussion in Fatehpur- Sikri, then the Mughal capital. Akbar invited astrologers to give their opinion on the form, appearance, and effects of Zu- Zanab’s flight. Asmat’s due date was approaching, making the journey potentially more perilous. As an Iranian saying had it, “From the day of conception on, a woman has one foot in this world and one foot in the other.” To ward off accidents during pregnancy, folk wisdom suggested, women should sew a few seeds of wheat or millet and a gold coin into a piece of cloth, and keep the sachet with them all the time.4 Somewhere just short of Kandahar, Asmat delivered her baby, a girl. The birth was most likely attended by a small band of servants, including a midwife, perhaps Dai Dilaram, the woman who would serve as Mihr’s wet nurse and remain with her when she became Empress Nur Jahan. The servants would have erected a separate tent or enclosure to ensure privacy for Asmat. Men weren’t allowed to view or help with the birth of a child; the code of modesty required that only women be present. If she followed the custom of the day, Dai Dilaram would have asked Asmat to squat facing in the direction of Mecca with a large copper platter containing a little dirt beneath her, so that the newborn child would immediately come into contact with the earth. Asmat, already a mother three times over, would be familiar with all the necessary rituals of birth. Dai Dilaram would tie the umbilical cord with a thread and cut it, then clean and purify the baby with a ritual bath and wrap her in a white cloth, as prescribed in Islam for both male and female newborns. (In death too, the body was covered in white, marking the completion of a life cycle.) Dai Dilaram would then assure others outside the tent, Ghiyas and well- wishers, that mother and baby were fine. Hearing the news, Ghiyas would have offered prayers of thanks for the safe arrival of his new daughter, Mihr un- Nisa. A beautiful infant in all legendary accounts, she surely brought a moment of pleasure to the caravan community amid the hardships of the road. Besides her parentage and her name, only one thing is certain about Mihr’s birth: She entered the world outside Kandahar in the winter of 1577, on the road to India. During her time as empress and after, in chronicles and legends, several key embellishments were added to the tale. By the eighteenth century, three fascinatingly different versions of her birth story had been published, each revealing a great deal about the teller and his times (the writers were all men), including prevailing attitudes about politics, gender, and religion. The snake survived as a popular ingredient in most of the colonial writings about Nur that followed Dow’s. In movies made before and after Indian independence from British colonial rule, Nur’s abandonment, the snake, and her rescue, became enduring motifs. An Italian quack doctor, an Indian courtier, a Scottish adventurer— each wrote of Nur Jahan’s remarkable birth. The Catholic mercenary Manucci was interested in an imitation of Christ. For Khafi, the Indo- Persian tales of migration and a man’s compassion for his wife were dominant. Alexander Dow and the early colonial writers who followed him were enchanted by a romantic image of India, that land of wonders, surprises— and snake charmers. In our time, tour guides from Lahore to New Delhi bring additional elements to the saga of Nur’s birth— for example, that light radiated from her baby face, in keeping with both her birth name and the one Jahangir would give her. 1. Akbar Nama, 3:311–17; Shireen Moosvi, “Science and Superstition Under Akbar and Jahangir: The Observation of Astronomical Phenomenon,” in Irfan Habib (ed. ), Akbar and His India (Delhi: OUP, 1997), 109–20; David A. J. Seargent, The Greatest Comets in History: Broom Stars and Celestial Scimitars (New York: Springer, 2009); Arthur Koestler, The Sleepwalkers: A History of Man’s Changing Vision of the Universe (New York: Penguin, 1990). 2. There is no historical record of the itinerary or the schedule that Asmat and Ghiyas followed in their passage from Persia to the land of the river Indus or Hind- Hindustan, as the northern region along the rivers Ganges and Brahmaputra, under the sway of the Mughals, was called then. But hints in the historical records provide clues and outlines of the likely route. The first Mughal (itinerant) king Babur, and later travelers, sketch evocatively the travel routes, geography, layout, flora and fauna, and pleasures and difficulties of voyages in these regions, which Ghiyas and Asmat were to navigate. Details of references follow below. For the part of the journey that would take Asmat and Ghiyas to the border of Persia, it was logical that they would first follow the popular (and the most direct) ancient route from Khurasan, along the southern slopes of the mountains that constituted the northern limit of the Iranian plateau. 3. Records mention the celebration of Ghiyas’s fortieth birthday in 1595. The translator of the Mughal gazetteer of Akbar’s reign mentions that a brother of Ghiyas Beg accompanied them as well. In the biographical notices of the grandees of Akbar’s empire, appended to the translation of the Ain-i Akbari, Jarrett notes that Jafar Beg arrived in India in 1578. No other source discusses this. Ain-i Akbari, 1:451. Rijal or the biographical literature of the seventeenth- century Mughal nobles, as well as court histories of this and later times give extensive details of Ghiyas Beg’s family background and the historical Iranian social and political milieu that may have driven him to India. A rare set of biographical sketches, striking for “non- official” facts, were put together by Shaikh Farid Bhakkari, a contemporary witness of the reign of Jahangir and Nur Jahan, and then of Shah Jahan. It is supposed to have been transcribed soon after its complication in 1650. The Maathir-Ul-Umara, an invaluable biographical dictionary of Mughal nobles compiled in alphabetical order, from the time of the first Mughal to the eighth decade of the eighteenth century. Compiled between 1741 and 1780, and drawn on Shaikh Farid above, the history of the production of this compilation is variegated and complex. The details are available in the Preface of the first volume of the translation, as well as in the introduction by Desai. H. Beveridge (tr.) and Baini Prashad (compiled and annotated), Shah Nawaz Khan and Abdul Hayy, The Maathir-Ul-Umara, 3 vols. (Patna: Janaki Prakashan, 1979); Amin Razi, Haft Iqlim (Aligarh: Qutbuddin Collections, MS. Persian 100/20). For references to Ghiyas Beg in the context of the discussion of Nur Jahan, see also, The Iqbalnama-i Jahangiri, and the Ain-i Akbari. Most modern histories refer to the context of Ghiyas Beg’s early career and family, as well as the later placement of various family members among Mughal ranks. Among others, Beni Prasad, History of Jahangir (Allahabad: The Indian Press Publications Private Ltd., 1962), especially chapter 7; Irfan Habib, “The Family of Nur Jahan During Jahangir’s Reign,” in Medieval India: A Miscellany (Delhi: I.M.H. Press for Aligarh Muslim University, 1969); 1:74–95. 4. Henri Masse, Persian Beliefs and Customs (New Haven: Behavior Science Translations, 1954), 7, 12. Details of the rituals of birth on 13–14. 5. Storia Do Mogor, 1:159. Starting as an artilleryman in Mughal prince Dara’s services, Niccolao Manucci (1639–1717), subsequently succeeded in attaching himself in disguise to the army of the last grand Mughal, Aurangzeb. He then became a physician to a provincial governor, and afterward a plenipotentiary of a Portuguese viceroy. Manucci gained fame as a (quack) “doctor,” and also worked as a foreign correspondent to a British governor at Madras. Eventually he began writing, and the product in 1705 was the Storia Do Mogor (The first English translations of this work appeared as early as 1708 and 1722). 6. Susan Stronge, Painting for the Mughal Emperor: The Art of the Book, 1560–1660 (London: V&A Publications, 2002), 137. 7. Khafi Khan, Muntakhab-ul-Lubab, 1:264. Only the dates of his death are available, 1732 or 1733. 8. Willem G. J. Kuiters, “Dow, Alexander (1735/6–1779),” Oxford Dictionary of National Biography (Oxford: OUP, 2004); online edition, January 2008, http://www.oxfordnb.com/view/article/7957, 1–2. 9. Alexander Dow, The History of Hindostan (London: J. Walker, 1812), 3:19–20 (1735–1779). The work was written between 1768 and 1772. This is an extract from Empress: The Astonishing Reign of Nur Jahan , written by Ruby Lal and published by Penguin Random House India. Republished here with permission from the publisher.